Properly sized battery banks can deliver reliable electricity for year - and sizing them doesn’t have to be complicated or time-consuming. In this article, you’ll learn how to slash electrical loads and accurately estimate power requirements. 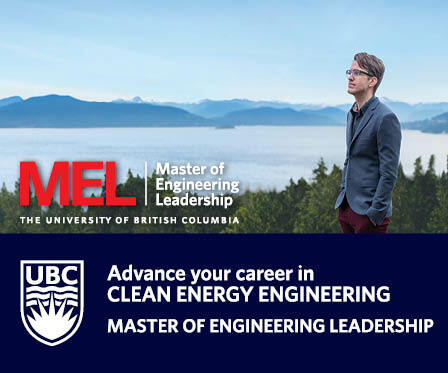 You’ll also discover how to avoid two little-known sizing errors that wreak havoc on renewable energy systems. Every extra kWh of electrical demand necessitates additional solar panel or wind turbine capacity and battery storage. For this reason, it makes sense to improve efficiency and lower electrical demand before sizing a system. Quick wins include replacing power-hungry appliances and electronics with Energy Star models, changing thermostat settings seasonally, and installing switchable power strips to eliminate vampire loads. Improvements to the building’s envelope can dramatically increase efficiency. In North America, for instance, almost half of household energy goes toward space heating and air conditioning. Adding blown-in insulation in walls and attics can reduce temperature transfer, and lower electrical loads. To decrease HVAC loads, consider high-efficiency traditional air conditioners. The newer, non-electric compressor, high-efficiency (20-30 SEER), Variable Refrigerant Flow technology offers even greater efficiency. Finally, non-electric compressor systems are a viable option, and can reduce heating and cooling loads by up to 90 percent. Whole-house fans improve comfort with minimal power usage, and nighttime ventilation is highly effective in regions with low humidity. The key to proper battery sizing is balance. Unused kWh of solar panels, wind turbines, and battery storage are a waste of money. Yet, undersized systems can leave you in the dark when you need power the most. Plus, the battery life of the system will be shortened due to deep discharging. Fortunately, there’s a standard method the entire industry uses to calculate electrical loads. After following previous steps to increase efficiency, estimate power requirements by reviewing utility bills for the last 12 months. Also, use a power meter such as Kill-A-Watt™ to uncover vampire loads, and provide accurate monitoring of individual appliances’ energy usage. For example, if a system needs 1,000 Watt hours (1 kWh) per day, a 12-volt / 84Ah battery bank (1,008W capacity) will be undersized, because the battery would be exposed to 100 percent Depth of Discharge (DoD) during every cycle. 100 percent DoD means 0 percent reserve power, which means this system is undersized. Renewable energy experts recommend sizing for a maximum of 50 percent DoD. This ensures adequate backup power during inclement weather, along with reserves for increased HVAC loads. 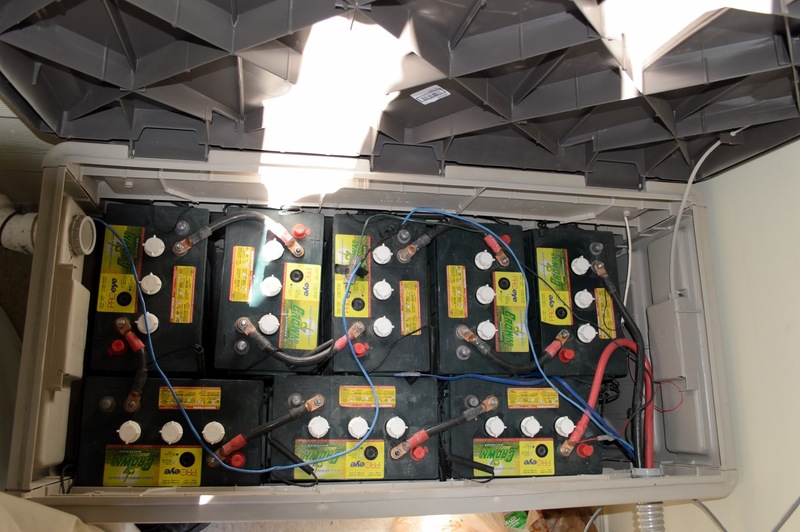 In the example above, the battery bank above should be 12V/168Ah, to provide double the estimated Ah requirements, and ensure only 50 percent DoD. 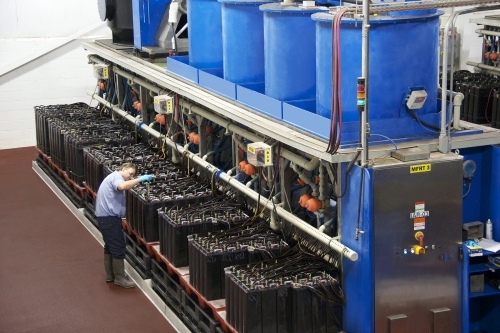 Recently, some battery technologies have been marketed for their ability to discharge 80 to 100 percent. There are several reasons to be wary of these claims. First, every battery must have power reserves for days with increased electrical usage or decreased solar or wind production. This is a healthy margin of safety. The solution? Always request that a system be sized for 50 percent DoD; comparison shop with these numbers in mind. Note that if an existing system still routinely drops below 50 percent DoD, installing an additional battery should help. Whether there’s a backup generator or just a battery bank, plan for 3 to 6 days of stored energy for off-grid systems. Surge capacity is a battery’s ability to handle high-draw loads like air-conditioning and refrigerators. This varies among battery types, and it can make or break a system. One emerging technology has a surge capacity so low (102A) that it can’t handle a 1kW load (such as A/C conditioning) for more than 5 minutes. Another technology, lithium-ion, has a low surge capacity (~280Ah); to exceed this, there must be load shedding or additional batteries. Whatever battery technology you select, make sure the manufacturer will provide you with printed specifications for surge capacity. If they refuse to give you this crucial measurement, keep looking. 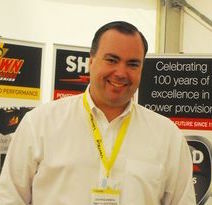 John Connell is the vice president of Crown Battery’s SLI Products Group. Crown Battery manufactures all its advanced technology batteries at its ISO-9001:2008-certified plant in Fremont, Ohio.